Why am I fascinated by nature and science? Maybe because I grew up near the Rocky Mountains, where I woke every day to an awe-inspiring view. Maybe it’s because I love the way science helps to explain how the world works. Maybe because I learned so many incredible things while earning degrees in Biology (B.A. ), Zoology (M.S. ), and Ecology, evolution, and animal behavior (Ph.D.). 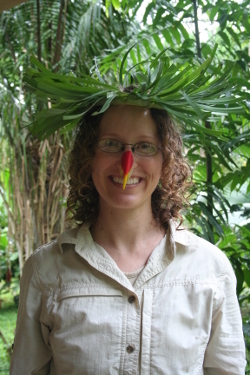 Here I am, decked out in traditional Amazonian garb, complete with banana leaf crown and bird-of-paradise-flower beak. Picking up a garter snake that promptly regurgitated hundreds of earthworms (a very effective maneuver that made me drop it immediately). Dipping my hand in a tub full of “baby” honey bees (newly emerged, less than an hour old–they couldn’t sting yet and were incredibly soft and teddy bearish). Being spied on by a doe. She crept up behind me and watched me from just a few feet away. Her soft eyes were enormous and inquisitive. Having a day gecko run up my arm and across my face to hide in my hair. Watching clouds slowly rotate during a thunderstorm. They only turn into funnels about half the time. Watching heat lightning play across an open field or hail turn the summer landscape white. Standing in the eye of a hurricane. Every kid deserves the chance to connect with nature through moments like these. That’s why I write. I bring the work of scientists to kids around the world through Highlights for Children, Science News for Students, ASK, and National Geographic Kids books. And sometimes super-cool scientific discoveries spark fictional adventures. So I write those, too. I am the Regional Advisor for the Nebraska chapter of the Society of Children’s Book Writers and Illustrators (SCBWI), a member of the National Association of Science Writers, and an Adjunct Assistant Professor at the University of Nebraska State Museum. Find out more about my adventures in nature and science.